If you would like to send a parcel to Gibraltar then look no further. Please see below our competitive rates. DHL Economy Select service – Door-to-door delivery for your single & multi-parcel shipments. Delivery within 2 working days. 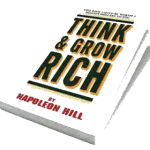 As a thank you for taking the time to look at our rates, we would like to offer you a completely free e-book entitled – “Think and Grow Rich”. A must read for people on a journey of personal development! This is the seminal book on realising your ideal life through thought and action. To receive a free copy of this ebook and join our mailing list for special offers, tips, free reports and regular newsletters, fill in your details below!